It seems ironic that Labor Day is a holiday for most Americans. Labor Day was established as a federal holiday in 1894 to celebrate the work ethic of Americans across all industries and their contributions to the U.S. economy. And it gave workers a well-earned day off. Today there are nine federal holidays giving folks almost two weeks off in addition to vacation time. A person would think that job satisfaction would be at an all-time high. However, today over half of Americans, 52.3% are unhappy at work per the Conference Board, a New York-based research group. This compares to nearly two-thirds of Americans liking their job just three decades ago. Is Labor Day about celebrating good work ethic and contributions to the economy or just enjoying a 3-day weekend? Labor days number 365 a year on the cattle ranch. Starting the day after Christmas, the bulls are put to pasture with the cows. On the first of January it is time to start working the calves – move them from the pasture to the working pen, separate the males and make steers of them. The work will continue into January along with the daily feedings and preparing the farming machinery for spring. In northeastern Oklahoma it is certain not to be sunny or mild but never mind the weather. There is spring planting to be done and equipment maintenance to keep up. In the summer it is cutting, baling, hauling and stacking the hay and harvesting the wheat. Then there is more equipment maintenance, moving cattle to different pastures and taking steers to market. Excellent work ethic is in the heart of the cattle rancher. Whatever you do, work at it with all your heart, as working for the Lord, not for men, since you know that you will receive an inheritance from the Lord as a reward. It is the Lord Christ you are serving. – Colossians 3:23-24. Whatever the job is, the labor is to glorify the Lord. It is a blessing to have the opportunity to work and provide for the family. There is an inherent satisfaction in work as the eyes stay focused on the Lord. If the eyes turn toward self and success, the heart gets distracted and satisfaction in the work takes a hit. Work is an opportunity to reflect the Kingdom in this world. As we work at it with all our heart, as if working for Him, He will be glorified. Cattle ranching has been in his family since the Cherokee Strip. 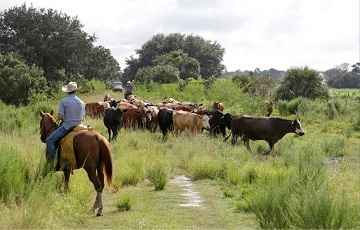 There is a passion for the work of farming enough to feed the cattle and for raising healthy herds year after year. The work ethic has been passed on to yet another generation through his example. A faithful father enjoys labor days as if working for the Lord. Really appreciated the Dad Talk this morning. The Word from Colossians, "Whatever you do, work at it with all your heart, as working for the Lord, not for men", was just what I needed to hear this morning. Thank you. A great one and hits a cord.